Situated in the center of the city. . Friendly and safe place to stay with 24hr security. Hot water and a ceiling fan. Wi-Fi is available. Breakfast provided on request Airport pickups and drop offs can be arranged. A walk from Zanzibar ferry. Kitchen is open to you. VIVA tower, NMB Bank and DTB ATM are in a 10min walk radius. Close to Aga Khan Hospital and Muhimbili hospital We are always available if you need further directions about getting around the city and anything else. Comfortable masterbedroom that fits two people,fenced house, safe neighborhood, 10km from the airport, 7. 6km to city center affordable bus fare, quick taxi service, near mini supermarkets service with low costs. ♡ HEAVEN OF PEACE ♡ "MY HOME, YOUR HOME"
Logement très propre, hôte sympathique et très réactif, rapport qualité prix imbattable. Mustafa's place is great, it has everything you could wish for in an airbnb. We liked it so much that we decided to come back. We most certainly recommend this place! Amazing value! it's a room in an apartment, nothing special, comfy bed and AC that cools the room off, but Mustafa makes it amazing. Super quick to communicate, helpful, and friendly. He even got on the phone and negotiated the price of our taxi down! I would stay there any time I'm passing through Dar again. You honestly won't find a better deal on Airbnb the world over. One of the best host we ever had: responses quickly, helps us arrange our next move, really friendly, took us out to a nice bbq place. Always make sure all guests have everything they need. Perfect location from ferry and train (walking distance, approx 15 min). The place in itself is perfect. Spotless clean and fully equiped. We definitely recommend this place to everyone. I had a really nice night in Dar, it had been a very short stay there, but I would do it eyery time again. Especially the way Mustafa gave tips to find his house, he informed the security and also the surroundings are very Dar like. After reading the past reviews, i expected Mustafa's place to be 5 Star, and honestly I blow away by just how better it was. Even before Check-In, Mustafa kept in contact with me to find out if I needed any assistance to get to his home, and after we checked out, he still kept in touch to find out how are trip had gone. The apartment is sparkling clean and the amenities are as listed. He is amazing and probably the most friendly person in Tanzania. Mustafa did everything to make us feel at Home, helped with suggestions when we needed and even gave us alot of snacks though we had a short stay. The location is amazing, just 5 minute walk from malls and market, right at the heart of Dar es salaam. I was really impressed. Mustafa deserves more than 5 Star! I will definitely be coming back to Dar es salaam just to stay at Mustafa's again. If you are looking for a place in Dar, look no further.. this is it! !Thank you for everything Mustafa, and well done for having such a great home. Great place to stay. We arrived late and left early the next day. Mustafa was a fabulous host, helping us feel very welcome with snacks and breakfast ready in the fridge and giving us tips on ferry and locations to stay on Zanzibar. Clean, great location near local restaurants and snack shops and 15 mins walk to ferry terminal - highly recommended! Situated in the center of the city. . Friendly and safe place to stay with 24hr security. Air-conditioned. Hot water is available. Wi-Fi is available. Breakfast provided on request Airport pickups and drop offs can be arranged. A walk from Zanzibar ferry. Kitchen is open to you. VIVA tower, NMB Bank and DTB ATM are in a 10min walk radius. Close to Aga Khan Hospital and Muhimbili hospital We are always available if you need further directions about getting around the city and anything else. Couldn’t have asked for a better experience at Elizabeth’s place. She was exceptionally kind and welcoming, making us feel right at home. She also gave us some great dinner recommendations. In terms of communication, she gave us great instructions and was really helpful over the phone. The room and bathroom were also comfortable. Thank you for a great stay! Great location and great hosts! Highly recommend! excellent as usual. See you next time. It was a nice place, but it is important to know for allergical people, that there live some cats in the house. The communication was amazing and Elizabeth is helping for transport and everything. We have stayed with Elizabeth and Derek many times and will continue to book with them whenever we are in DAR. They are excellent at responding to questions and providing advice on logistics while in DAR within a fast turnaround time. We can easily get to Zanzibar Ferry, City mall gym, Viva tower, and express bus DIT station back to Ubungo bus stand for further travel. However, we generally book a taxi or ride with them to and from Ubungo, but its nice to have the option for express bus when its more practical. We really feel at home with these hosts and look forward to our next visit. Very central location is nice. Good simple room, clean and quiet. Provided drinking water which was generous. If you are heat sensitive, just know this room still feels very hot even with fan and AC both in use, somehow hotter than other areas of the house. It was an uncomplicated stay and we appreciate the hosts. Thanks again!! This is a simple and comfortable room that can suite a single or even a couple. The house is a spacious villa that is located close Ali Hassan Mwinji Road, a step from the Peninsula and very close to town centre. The house is a spacious villa situated close Ali Hassan Mwinyi road, just few steps from American Embassy, Masaki and town centre. The room has a fan. There's laundry service (for guests who are staying for more than 2 days). Internet access (no streaming and video calls). The accommodation is simple and clean and adapt to people who are not looking for luxury but desire to stay in a clean and friendly environment. The house is strategically situated close to Ali Hassan Mwinyi road, just few steps from American Embassy, Masaki and town centre. Guests can walk around and enjoy the many shops in the neighborhood because, differently from Msasani and Masaki, the area is very safe. Within 5min guests can reach the Shopping Malls as well as the beach. Härlig atmosfär. Stort och rymmligt hus fullt av fantastiska människor. Alexandra är verkligen välkomnande och vi kände oss som hemma i Dar es Salaam tack vare henne. Bra och tryggt läge. Kan varmt rekommenderas. Alessandra and her place were highlight of Dar Es Salaam stay :) Everything was clean, kitchen is well equipped to prepare food and we enjoyed spending time with her as well. Definitely recommend! The place to be! Perfect location with a lovely host family. The house is huge and beautifuly decorated! Great place! Felt like home, I like the house environment and the two pets Bianca and Mambo :) am a dog person, so yeah! Here for a business meeting but with places like this I think I will always stay on Airbnb next time around :) Thank Alessandra! Fantastic space, really beautifully designed and great facilities. The only problem for us was that we found the bed uncomfortable. We started our trip in Dar es Salaam and had a great time at Alessandra's place. It is very good located and Alessandra and her team are very friendly and always helpfull! Amazing and very secluded uptown compound, very close to all important areas yet very secluded. Beautiful villa with all the amenities inclusive. There's a gym in the compound with basic machines. Eating spots and the beach is less than 3 kilometres away. Lilian is great with making sure the stay at her place is smooth. Very helpful with transport and information regarding comps in the area. Everything is in place and as described, the family is delightful and welcoming, the location is central, the house is lovely and it has every convenience, great if you're staying for a while. This is far nicer than staying at a B&B or hotel and has the benefit of the personal touch. Very highly recommended. Mustafa is an excellent host and couldn't have done more to make me feel at home. The flat is in a great location for the ferry port and other amenities and is comfortable and very clean. Hope to stay here again soon. Nice and lovely place to spend a night or a longer period with comfort, and all the amenities you might be looking for. Superb hospitality, local tips and host's readiness to help with any issue make you feel really cared of. Clean and super cosy apartment, spacious guest bedroom, equipped kitchen, hot water, all the basics and even more than you may expect, elevator in the building and great location makes this place really worthy for the little payment you spend. I highly recommend this place and this host and will be coming back here whenever I need an accomodation in that area again. Everything was very good, just for the internet signal that’s not so good, but otherwise I would back to this place again. Thank you so much to Mustafa. This was my second time to stay with Mustafa and I will always first check availability here when Im booking something in Dar. Lovely host, house and location. The AC is also a very big plus! Thank you again Mustafa, and see you soon. Mustafa always answered in short time, organized everything what I needed and was just a perfect host. Extremly big living room,very clean and tidy place and free of husle and bustle. Hello traveler we have a room available for you in Dar es Salaam . 23 kilometer from city center,Is nice place than city, Private room, If your interested to be hosted and learn African cultural your most welcome, Enquirer for more details. Start the day on a lounger, sunny city of Dar es salaam view balcony at this designed unit high above on the 13th floor is highlighted by expansive sliding aluminium large windows through offering bright view of and breath taking air from Indian ocean. Colorful accents, inviting, comfortable furnishings are featured throughout. Shops are very nearby. Ideal for couples, business travelers, writers, artists, journalists, internship Dr.´s and adventurers. A lovely sunny feel for this gorgeous room overlooking Muhimbili national hospital, Jangwani valley and parts of city view. Located in Dar es salaam city on a peaceful and quiet long lined street of Mindu. Three en-suits sharing bedrooms, two are master with king beds and one queen bed. Shops are very nearby as well as nice local restaurants. The flat comfortably accommodates 3 people sharing living room, dining and kitchen. It feels like a holiday home being so welcoming, light and spacious. The living room area is open plan: A cosy living room that has flat screen cable TV, a conservatory coffee table and a comfortable dark brown sofa with organic colorful allergy free pillows. Our curtains are made by organic cotton textile. 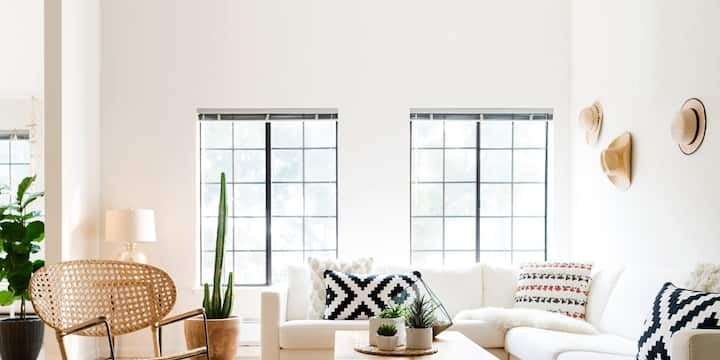 Fresh air and day light comes from french styled glass wall to wall windows connects living room and balcony. The dining room: Is connected with living room on L shape structured. It has hard timber table that easily fits six people with modern silver iron stand lampshade creating a nice dinning atmosphere as well as Swahili art-deco to make the most of the space with Swahili coast looking. The Kitchen: A medium sized kitchen ideal for cooking with a modern range cooker with gas and electric plates, microwave, premium fridge and freezer, cartridge and all necessary kitchen utensils. A washer/dryer is at your disposition. Master bedrooms: The two master bedrooms are extremely airy and bright light, quiet with large glass wall to wall windows connected to balcony facing city view, Jangwani valleys, far away landscaped hills and buildings of Dar es salaam university. All rooms have king size bed with organic cotton pillow, bed sheets and allergy free curtains. Side bed timber tables, reading or office table. A separate rain shower equipped with a modern handset. A towel rack toilet and hand wash basin with entrance of hard wooden door. The third en-suit bedroom with king size bed and two side tables is without balcony but contains a large window for bright light and airy. All rooms have air condition and ventilator. The flat has its own fire extinguishers and fire blanket, telephone access to security guards. Gorgeous Kiva hill room is a NnJ property located at central of Upanga west in the center of Mindu street. Here you find choice of supermarkets, mini shops, cafes, restaurants and main Tanzania hospitals. National museum and ferry market which is popular historical fish market is 10 minutes to reach by transport. This unit transport links-all just a short walk away. You will stay in a quiet area surrounded by embassies and in walking distance to the bustling City Centre and Zanzibar Ferry. Visit nearby sights (museum, fish market) and enjoy the neighbouring bars & restaurants. The room is occasionally used as a private office -great to get some work done! While we're proud of our cozy apartment, the compound has issues with maintenance - it's more 'real' rather than 'nice'. Your hosts are Caren, a Tanzanian, and Samuel, her Swiss partner. It's a simple apartment, equipped with traditional African decor (we are in particularly excited about our small collection of masks) and unique furniture - most is handmade from local boats ('Dhow') or other reclaimed wood. The room is sometimes used as a private office by Samuel and usually made available when Samuel is traveling (about 75% of the time), when his partner, Caren will host you. The compound consists of apartment blocks, which were built in the '70s for railway staff (therefore they are usually referred to as 'railway flats'). The compound itself not well maintained, with some informal shops and broken down cars present. The compound is located in what was the 'European Quarter' during colonial times, this means it is relatively well planned area with tree-lined roads and a golf course/sports complex, many embassies, government offices (including the state house) nearby. It is nice contrast to the bustling and chaotic scenes of downtown Dar. There are many peacocks roaming around the area and sometimes you can even spot monkeys who come over from the nearby botanical garden. There are some historic buildings nearby and further downtown, which can all be easily explored on foot, as well as the chaotic fish market or the national museum. One thing we really enjoy is to overlook Dar at night from one of the rooftop bars in the vicinity. Chez Samuel & Carren c'est un appartement situé au centre ville pour découvrir la partie historique de Dar-es-Salaam. On peut se balader sans frais de taxi ou autre. L'hospitalité et l'amabilité sont au rendez vous. On a juste hâte de revenir. Caren is well organized and has a good taste for the appartment. The home is very bueatiful and Caren was a great host. The bed was very comfortable and the AC and shower worked great. Caren even woke up at midnight to help us find a taxi. I would recommend them as hosts! The place is really well located near the center and the ferry to Zanzibar! The place is perfect for a couple and the amenities that the room has are great! Also the communication was super on point and helpful! Samuel and Caren’s place is in a great location; super central, easy to get public transport and within walking distance of food and drinks. Their house guide and tips on local attractions was a great plus, not to mention very helpful details on how to find their place. Definitely value for money for the great location, stylish space and warm hospitality. Staying at Samuel and Caren’s place was awesome. The space is beautiful and the bedroom is really comfortable with all the necessary amenities. Caren was fantastic communicating with me and offering tips. The location is also great for wandering around downtown Dar. A great stay, thank you! This will be my go to place when I visit Dar. Sam and Caren’s place is stylish, centrally located, and they were so helpful and communicative. They helped me arrange a taxi driver from the airport and even communicated to him about a few stops I wanted to make along the way. The house is very comfortable with great interior design. It’s in a location that allows you to walk to most places in the downtown area yet I found that the neighborhood was very quiet at night - perfect for light sleepers and rare for such a big city! You will love this cozy retreat in the city. Caren and Samuel are great hosts!! Nice house, great wifi, friendly environment, I recommend this place to everyone!! My guests When you come in home expect peace, love and harmony. I will make my neighborhood specially is through our tradition activities. Standard rooms with pleasant light blue and white colurs walls with marble tiles floor,wide windows for enough fresh air and light...about 5 min walk to the main road and 15 min ride to the near beach. Private parking space and enough security. Airbnb finest, the space is comfortable, neat and clean. It is the place that you will always feel at home whenever you are in Tanzania. The space is full time secured, lift to the step of your door, Local market is 2min walking place that sells fresh organic and also fish of the day. Near to the beaches, 15km away from the airport, 6km away from the ferry port to Zanzibar, and also very near to the up-country buses Ubungo, Local transport is just on the step of your door i.e. Public transport(Rapid bus station in-front of the building and daladala) Bajaji(three wheel), Motorbikes(Bodaboda), Uber, Taxi's e.t.c so you can go anywhere you want easily. Emplacement super pour se balader dans Dar es salam. Hilda habite en face des bus express.. elle peut vous trouver un taxi qui vous récupère à l'aéroport. It was wonderful to be with Hilda, she is such a nice woman. We had some very good days together. I felt at home. And she is a good cook and provides you with helpful information about Daressalam. I'm going to come back. Smart lady and comfortable accommodation. Just in front of public transport which goes to the city center. New therefore clean apartment. Well prepared. Hilda was so helpful and she responded to my messages so quickly and even called me during my travel day to ensure that I was okay. Hilda and Danny, are so hospitable, warm and they make you feel at home. The breakfast was good! The apartment is very accessible and I used the rapid bus to the nearby Aura Mall and Uber to get around the other areas I visited within Dar Es Salaam. I would recommend this place, if you wish to stay anywhere near Dar es Salaam and also to get to the Zanzibar Ferry Station. Thank you Hilda and Danny for making my stay very pleasant. Hilda was an amazing host. She was very fast in communication. She is kind, also a very good cook. Her place is very nice and clean. I enjoyed every bit of my stay there. I would definitely 100% recommend it. Hilda is the best host ever. She makes delicious food. She really knows city very well and she's a very helpful host. A spacious private room in a big house located right at the heart of Msasani peninsula. It has great location, near big shopping malls like Msasani mall and shoppers Plaza, both in walking distance. Easy access to many hotels and restaurants in Msasani, Oysterbay and Masaki area. Secure location next to the American embassy, Oysterbay police station and guarded 24/7 with standby generator on. A balcony with great view and cool ocean wind. I arrange safari trips to Mikumi National park. This one of 2 guest rooms in a 3 bedroom apartment. The other room is listed as Msasani House 2. I live in the same house occupying the 3rd room. It is a spacious room with a private bathroom and fitted with air conditioning. It has a balcony that offers a great view of the surrounding neighborhood. It also provides fresh cool wind from the Indian ocean. The house has also a big living room with sofa set , tv and a working area with a desk and office chair accessible to use by guests. The kitchen is equipped and free to use by guests. I cook occasionally and usually happy to share my food with my guests. There is a washing machine free to use. There is also a cleaner who cleans the house and will also wash your clothes with no additional charges. The apartment is on the 3rd floor but you will be assisted carrying your stuff up the house. The house is located in a great location. 2 big shopping malls within walk able distance, many local shops near by where you can get day to day supplies. Many restaurants in Msasani, Masaki and Oysterbay both in few minutes drive. The Zanzibar Ferries, The bus terminal and Airport , both within less than 45 min drive. Coco beach also in a 10min drive distance. The area also offers a vibrant night life with great areas for night out and fun. the area offer everything you need. From shopping malls, Movie theaters, restaurants, beach , bars, night clubs, you name it. It is within few minutes drive or walk to some of the famous outing places like Tipps launge, Samaki samaki , Element, Next door, Buckets etc. All less than 10 minutes away. Msasani and shoppers plaza malls all within a walk distance. There are also local shops where you can get your day to day supplies and local foods too. Safe and quet neighbourhood. Just next to the American embassy and Oysterbay police station. Merci à Joseph pour son accueil et son hospitalité. Il nous a préparé un délicieux repas local. Les échanges ont été très simples et sans prise de tête. Super rencontre! Le logement est basique mais suffisant pour découvrir les environs de Dar es Salaam et la vie locale. Schönes Haus, gemütliches Zimmer, sichere Gegend mit guter Anbindung in die Innenstadt, sofern nicht in der rush hour. Strand ist in der Nähe und super entspannt, 5 minuten mit dem Tuk Tuk.. Joseph ist super nett und spricht sogar ein bisschen deutsch :D ich hatte super viel Spaß hier! Joseph is a super host. His house is amazing and very stylish and comforr. He was so helpful and very approachable guy. He gave me privacy and also gave me company during my stay. I definately recommend to any to stay at his place. Joseph's home is exceptionally clean. He is a great communicator. I would definitely stay again. Best place I stayed in Dar. Joseph is an incredibly awesome host! The house has a great view of the Indian Ocean coast. It is right by the main road and a step away from the main road to Bagamoyo and to downtown Dar es Salaam. Joseph is incredibly understanding and flexible and made every effort to accommodate any requests we had. The place is great and the host even better! We had a very good time at josephs place. He was very friendly and helpful. The place has a 24/7 fully back up generator , high security with cameras within the compound. The neighbourhood is very quiet , its a nice place to just sit back and relax. Farizal’s place is a one bedroom efficiency apartment on the first floor, just a 3 minute walk from Coco Beach. He hasn’t missed a thing that you would need in a home away from home - strong Wifi, cable TV, a desk, hairdryer, iron and ironing board, a wardrobe, a/c in both rooms, hot water, soap, towels, plates, cups, utensils and a non-stick skillet on the 2 burner gas stove. I cooked my meals there, worked at the desk and slept well! Great choice and excellent price! Great place for single or couple travellers. Close to the beach, in a safe, quiet and clean neighborhood and within walking distance to most of the cool places around. Would definitely stay here again! I only stayed for 2 nights, but found this to be a very nice budget friendly place. It is in a great location in the peninsula, quiet and very secure. When I first arrived there was no water to the apartment, but was resolved within a few hours. For the great price, you get DSTV, AC in both the bedroom and living room, hot shower with great water pressure. At the time I stayed, no additional charge for Luku. Although Farizal was out of the country at the time, the staff at the apartment complex kept the place very clean and were helpful. I would definitely stay here again when I travel into town. I recommend it! Fairzal is an amazing host! went above and beyond to help me find an atm, find affordable rides downtown, restaurant recommendations, etc. His sister was also an amazing host! Would definitely return! Good position, excellent people running apartments. Apartment daily basic. Stayed one night for business travel. Awesome space and very convenient. Looking forward to stay again. PS: The host is very helpful and a call away. Great place. Close to most places of interest. Nice and clean. Simon, the caretaker is of great help is ever so kind. Fast WiFi, ample channels from cable TV. Apartment in on the ground floor, which was great for me as l had quite a bit of heavy luggage. There is no lift . A kettle for making tea and coffee would be nice. Great place all in all, great value for money. Also, do switch off the boiler after taking a shower. I wasn’t aware that l had to in order to save electricity, so l had it on the whole time l was there(3 days). There was a power cut once during my stay, but it wasn’t a problem because there is a generator which comes in shortly after a power cut. I am happy to help whenever available, like to get to know my guest, so we can go out on the weekends (I work on weekdays), I live alone , sometimes my younger brother and nieces visit(mostly around Christmas and June holidays). I love swimming, dancing, singing, meeting new people is always interesting, so MAKE SURE you have FUN and FEEL AT HOME. Eu est une personne sympathique. Elle est venue nous chercher à l’aéroport, nous a amenée en centre-ville, au supermarché et au bus pour Arusha, contre rémunération assez élevée. Elle a partagé sa connexion internet sur son téléphone car il n’y pas le wifi chez elle, mais seulement quelques minutes par jour. La maison est située loin de tout. C’est loin de l’aéroport et encore plus loin du centre-ville. Le quartier est très pauvre et nous ne nous sommes pas senties en sécurité du tout. Il y a un garde la nuit car le quartier est dangereux. Nous sommes restées enfermées dans la chambre le deuxième jour. Le bus pour aller au centre-ville est petit, rustique et plein de monde. Nous n’avons pas voulu monter dedans. Le logement est sale, en particulier la cuisine. La douche est dans les toilettes, elle coule mal et l’eau est froide. La chambre comprend un lit king size mais elle est petite. Il y a une moustiquaire au-dessus du lit et sur la fenêtre. Je ne conseille pas ce logement. Remember this is Africa. You can't compare it to European or US standard. If you can accept the local way of life, there is no better place than Eu's. She is the nicest girl you'll ever meet. Intelligent, funny and so helpful. There's no way we would've managed to see as much as we did without her. She saved us so many times and offered much much more than just accommodation. I feel we not only found a good place to stay but a great friend as well. Thanks again. Grace is a welcoming host who went out of her way to arrange airport pick-up for me on arrival. She even walked me to a local food vendor at night to get some dinner, and kindly dropped me into town to catch my ferry! Pick this place if you're after somewhere simple and no-frills to stay that is close to the airport. The room is great if you're transiting in Dar Es Salaam and need to be near the airport. It was clean and the bed was comfortable. Grace and her brother John were nice and very accommodating. Grace is an incredible help before and after your stay in arranging transportation. The house is perfectly located for a one night stay before or after your trip to/from the airport in a quiet neighborhood. Tanzania, in particular Dar es Salaam, has a subculture of Indian-Tanzanians who have been here since the 40s. Come and explore what that looks like by living in our hospitable and welcoming family. Learn to cook our special cuisine and eat with us. Get all the inside scoop of what life is like here. Make your travel more than just the tourist things, although we can recomend you some must do’s in Dar. It’s a duplex house with 2 floors. The bottom floor is the common area that has the living room and kitchen. This floor is the place you can hang out and interact with us, or also learn how to cook Indian food with mama. It has also television and one bathroom. The top floor has the room where guests can stay and also other rooms where my family stays. It also has another shared bathroom. In the city centre just a 5 minute taxi ride from the Zanzibar ferry port, 5 minutes walk from the local market and all the hindu temples. JUST AMAZING ! The best way to discover the city, and a part of its culture. As Indian people are a entire part of Tanzania, it's really interesting to discover that aspect of this mix culture between India and Africa. The host are so nice, i could'nt believe it! And the best homemade Indian food ever tried. The place is really in the city center, and the neighbourhood is quiet. Important thing, they have AC to fight the hot in Dar Es Salam ! I recomanded it 100%, perfect quality/price ratio, and personaly i will remember all my life the stay in this family. Happy Feet Backpackers is a home stay that offers guests a serene atmosphere, that is located in the secure, quiet suburb of Mikocheni Dar es Salaam. This Home stay facility is ideal for backpackers as It's within minutes of the most exotic beaches, Zanzibar ferry, The famed Ubungo bus terminal, Julius Nyerere international Airport, as well as Dar es salaam's finest eateries and night clubs. Guests can enjoy these amenities while staying at Happy Feet is central to these ideals. The famed Makumbusho Art museum is 1 minute away, Downtown Dar es salaam is 7 minutes away and guests can enjoy the luxury of home cooked meals at this Home Stay. Happy Feet Backpackers boasts of a recreational park within Minutes walk, The famed Mbala mwezi beach club which is within 4 minutes , The famed coco beach which is barely 5 minutes from the facility as well as a slew of high end restaurants. Some of the finest Hospitals are also within 3-4 minutes from this facility, example, Kairuki memorial, TMJ hospital among others. Agnes place can be a bit difficult to find so just ask for some detailed directions and you will be fine! (To be fair we didnt have internet, would be much easier with a working phone) Once we found the place check in with Agnes was easy and she showed us around the place. The room is large with a comfortable bed and everything is super clean. There is a large ceiling fan keeping the room pretty cool. The house is located within walking distance of restaurants / shopping centres but you would need to get a taxi / motorbike to get into town. Agnes gave us all the information we needed to get the ferry to Zanzibar the next day. This place is great value for money and we would stay again! Best accomandation for the first days in Tanzania! The hosts are very hospitable and can help you during the hole day with your needs. During our stay they showed us some local places around the neighborhood, otherwise we‘ld never had the chance to see such impressing areas in Tanzania. The food is affordable and very delicious. The area is very safe and you can reach the bus stations in a few minutes with the tuktuk to drive to the city center. A Shopping Mall is only a 5 min walk away. Agnes is incredible! She will welcome you like family, we have past three days there and it was really nice! Distance walking from the supermarket and others local restaurants, the breakfast is delicious, she have even make us dinner... Really we have been in a lot in Airbnb in Dar and it was our favourite! Beautiful house and yard! Asante sana! It was a pleasure staying at Agnes place. You felt very at home there and Agnes was very helpful with answering questions about anything. We would deffenetly recommend to anyone going to dar es salaam. Uswazi cozy apartment, is a master room with 1 big king bed which is great for sleeping 2 people, it has Air conditioner and fan, a three seats couch, a confortable table for working, three open shelves and hanger for your clothes and stuffs, the refrigrator, it has enogh space for cooking small stuffs if you would like, two window for enough ventilation. close to this place, 5 minutes walk to shoppers mall, 10 minutes to Myfair bodyline fitness. 20minutes drive from airport. This is a very cosy and clean double room (it fit up to 4 people) with its private bathroom, an extra studio room and its private balcony. Basically it is a small apartment that can fit up to 4 people. The house is a small villa strategically situated few steps from the Peninsula, town center, shops, restaurants, malls and clubs. There is WiFi internet and basically all what you need for a pleasant stay in Dar es Salaam. The house is very close to the bus station, taxi drivers parking and motorbikes taxi service point. If you like nature, you can have a day trip to the paradise: in 5min you can reach the boat to Bongoyo Island and have one of the best snorkeling experience ever. The house is strategically situated on Ali Hassan Mwinyi road, just few steps from American Embassy, Masaki and town centre. Guests can walk around and enjoy the many shops in the neighborhood because, differently from Msasani and MAsaki, the area is very safe. Within 5min guests can reach the Shopping Malls as well as the beach. Réactivité et bon rapport qualité Prix. A proximité un restaurant chinois EXCEllent, petit quartier paisible...Cuisine équipée pour se préparer de bon petits plats. Great location. Clean, comfortable and a welcoming place to stay. Very accommodating. One thing is to definitely bring ear plugs as early morning prayers can wake you up around 5 but this is all part of the experience. I really liked the house. Very cozy and beautiful decoration. Christina although we didn't get a chance to meet in person she was always checking up on us and sent us the necessary information to get to her home. Recommended! We only stayed one night at Alessandras place. Without meeting Alessandra herself, everything was good and well organized (except the fact, that we didn't had wifi to read your messages, haha, but that's of course not your fault). We could reach Alessandra in every situation and she described the way to her house and everything else with a lots of details, so it can't go wrong. She also organized a Taxi to the airport for me, because I had to go there by night. Thank you for everything! Alessandras accomodation is definetely price-worthy and quite well located in a nice but ordinary neigbourhood. The house is nice and Alessandra, her husband as well as Rehema and the other househelps and nightguards are all very friendly and helpful hosts. Their place is also good to make new friends in Dar. However the neighbourhood can be quite noisy from time to time and one of the dogs present in the compound certainly has some mental problems since he does not regognize you all the time. Finally, there are a lot of mosquitos compared to other areas of town and not all the pictures and descriptions are accurately placed fo each of the different rooms, but that does not matter that much due to the same standards. Anyway, thanks a lot to everyone present in Alessandras place! This is the second time I stayed at Alessandra when visiting Dar. And properly not my last. She has a lovely house located in a quite area with good access to the peninsula. And the ability to make a much needed good cup of coffee on her mocca, thanks! LOOKING FOR A PLACE TO STAY IN THE HEART OF DSM CITY? City Centre Apartments are ideally located in a safe and friendly neighborhood in CBD, Dar-es-salaam. The 2bedroom apartments are equipped with all amenities including a separate sitting room and kitchen. The apartments are situated 7-10 minutes walk from the Zanzibar ferry port and 12km from the airport. City Centre Apartments is the perfect place for your ideal city break! 7 storeys of residential 2 and 3 bedroom furnished apartments. The building is ideally located on Zanaki/Jamhuri Street (DTV roundabout). this place is right in the indian ocean beach. therebis 24 hr security by group four security company. it is next to most expensive area in dar es salaam called oysterbay and masaki where most expartriates and ambassadors live and have offices. the best hotels sea cliff and many are within. therebis also the best restaurants like the capetown fish market. slipway beach and yatch club recretional areas are within. it is 15 -20 minutes from the CBD. It is a private room in a three bedroom apartment. Karibu to my two bedroom apartment in Ada Estate in Kinondoni! The apartment is on the first floor (one flight of stairs) in a quite area nearby to restaurants, a mall and the movies and a short car ride to the best restaurants in Dar es Salaam. You are welcome to enjoy the living room and cook in the kitchen. There is one bathroom that is shared with a shower. The bedroom has a queen size bed and AC with a lock on the door. There is WIFI in the apartment. For breakfast you are welcome to eggs/coffee/tea in the apartment. The apartment is located just off a main road (All Hassan Mwinyi road), keeping you close to the action, but far enough away it is still peaceful and quiet at night. You are a short walk (or bajaj/uber ride) away from the Dar Free Market Mall, where you can watch the latest movies, have dinner, and access ATMs. Or head in the other direction and you will shortly arrive at Governors and Four Ways - local favorite bar/restaurants. The apartment is 10 minutes from all the great restaurants on the peninsula, and slipway where you can grab a boat to an island for the day. Or 15 minutes from downtown Dar es Salaam, including Kariakoo market. it is a good place and we offer Swahili service for foreigner incase needed, there is traditional food and cultural education. Situated in the center of the city. Friendly and safe place to stay with 24hr security. Room has a ceiling fan, huge bed and closet. Hot water is available.Breakfast provided on request. Wi-Fi is provided Airport pickups and drop offs can be arranged. A walk from Zanzibar ferry. Kitchen is open to you. VIVA tower, NMB Bank and DTB ATM are in a 10min walk radius. Close to The Aga Khan and Muhimbili hospital We are always available if you need further directions about getting around the city. Very nice and save, awesome shower! The bed is also very big, so even if you're two persons you still have a lot of space in the bed. Super cleas and nice hoting , we very much enjoyed when we sayed here. Highly recommend . The place is so convenient for reaching the Zanzibar port. I am looking forward to staying with Elizabeth place once again. Elizabeth is quick in responding. I appreciate the support I received during my stay. I will definitely stay once again. Liz & Derrick's place is very clean, conveniently located, furnished with valuable amenities & much more. You will meet a warm, welcoming team, with excellent communication & support. It's certainly great value for money & I highly recommend it for guests. Great host, very helpful. Answers very quickly. Nice and cheap room not too far from airport. Pick-up from airport was arranged by hosts which was really helpful. The location is spot on. A walking distance to the beach, the supermarket, and forex bureau are downstairs. The gym and swimming pool are available all the time. Its clean, amazing hosts, Kariokor stage is close by. The balconies offer an amazing view to the ocean. Looking forward to my next visit. Pearl at Oysterbay in Dar es Salaam is a strategically located apartment, close to the beach, restaurants, bars and cafes. Staff are friendly. Other facilities such as swimming pool and gym are super. Vivian's place was a great experience. He was very responsive and helpful with info about Tanzania. I was also able to work on the large dining room table with fast wifi. The location was great also, close to coco beach and many restaurants and pubs. I would highly highly recommend this place and come again next time in Dar. Thanks Viv for showing me around!! Habari ........ ! Start the day on a lounger, sunny city of Dar es salaam view at this designed unit room high above on the 13th floor is highlighted by expansive sliding aluminium large windows through offering bright view of and breath taking air from Indian ocean. Colorful accents, inviting, comfortable furnishings are featured throughout. Shops are very nearby. Ideal for couples, business travelers, writers, artists, journalists, internship Dr.´s and adventurers. A lovely sunny feel for this gorgeous flat overlooking Muhimbili national hospital, Jangwani valley and parts of city view. Located in Dar es salaam city on a peaceful and quiet long lined street of Mindu. Three en-suits bedrooms, two are master with king beds and one queen bed. Shops are very nearby as well as nice local restaurants. The flat comfortably accommodates 3 people in different rooms sharing living room, dining and kitchen. It feels like a holiday home being so welcoming, light and spacious. The living room area is open plan: A cosy living room that has flat screen cable TV, a conservatory coffee table and a comfortable dark brown sofa with organic colorful allergy free pillows. Our curtains are made by organic cotton textile. The dining room: Is connected with living room on L shape structured. It has hard timber table that easily fits six people with modern silver iron stand lampshade creating a nice dinning atmosphere as well as Swahili art-deco to make the most of the space with Swahili coast looking. The Kitchen: A medium sized kitchen ideal for cooking with a modern range cooker with gas and electric plates, microwave, premium fridge and freezer, cartridge and all necessary kitchen utensils. A washer/dryer is at your disposition. Master bedrooms: The two master bedrooms are extremely quiet with large glass wall to wall windows connected to balcony facing city view, Jangwani valleys, Muhimbili national hospital and far away landscaped hills and buildings of Dar es salaam university. All rooms have king size bed with organic cotton pillow, bed sheets and allergy free curtains. Side bed timber tables, reading or office table. A separate rain shower equipped with a modern handset. A towel rack toilet and hand wash basin with entrance of hard wooden door. The third en-suit bedroom with king size bed and two side tables is without balcony but contains a large window for bright light and airy. All rooms have air condition and ventilator. The flat has its own fire extinguishers and fire blanket, telephone access to security guards. Gorgeous city view Kangáta room is at central location of Upanga west at Mindu Place building in the center of Mindu street. Here you find choice of supermarkets, mini shops, cafes, restaurants and main Tanzania hospitals. National museum and ferry market which is popular historical fish market is 10 minutes to reach by transport. This unit transport links-all just a short walk away. We offer you a simple and comfortable room that can suite a single or even a couple. The house is a very spacious villa that is located in a very big villa on Ali Hassan Mwinji Road, a step from the Peninsula and very close to town centre. The house is a very spacious villa strategically situated on Ali Hassan Mwinyi road, just few steps from American Embassy, Masaki and town centre. The room has fun and you can ask for A/C. There's laundry service and Internet access. We have also a huge garden. The accommodation is simple and clean and adapt to people who are not looking for luxury but desire to stay in a clean and friendly environment. Je n'ai passé qu'une nuit chez Christina mais elle a été très réactive pour répondre à mes questions, même quand celles-ci ne concernaient pas La maison (ferry, taxi, etc). Et Christian, son mari, m'a très bien accueilli, me demandant si le trajet pour arriver s'était bien passé. Dans la chambre il y a un ventilateur et une moustiquaire, très pratique. Je vous recommande cet endroit. People here are very friendly and it became easier to navigate once getting used to. Rooms were quite spacious and basic amenities were provided. Good value! Thank you to Rehema for always being ready to assist with any need. The house is lovely and would definitely recommend to anyone looking for a place thats both cheap and close to most of everything. this is a cool place! we did not meet christina herself, but she guided us very well via textmessage. her householder makes a very good job, everything is well organized. it feels like an international shared house, as there are a few rooms rented to different people in this large house. it's great, you always have the possibility to have a nice chat in the kitchen or the living room. strong wifi! asante sana! Alessandra is a wonderful host! We came a day late because of an airport chaos in Istanbul and had to stay two more nights. All of this was no problem and we could stay a little longer in her beautiful house. Alessandra gave us good tips about getting around in the town and her two kids are just too cute. While the room was basic, but had all we needed, we could also use her kitchen with fridge and were able to hang in her spacious living room. The neighborhood seemed save and we had no problems walking around also during night. Since she has more rooms, we also meet other guests to talk and share our first Tansanian experiences. We can highly recommend this place and would definitely come back here if we stay in Dar again. Great value for money! Clean space. Lovely host. I'll choose this place over and over again.